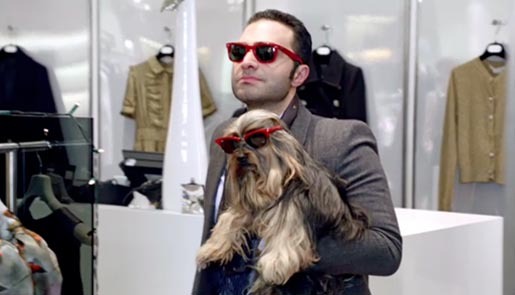 Harvey Nichols, the UK retail chain, featured dogs as accessories in “Not Just For Christmas”, their 2010 Christmas TV advert. Snooty designer label aficionados shop for pedigree Harvey Nichols accessories (a.k.a ever-so-cute canines) to go with their shoes, sunglasses, jewelry, handbags, coats, all to the tune of “Jingle Bells”. The advert ends with a pug pup being wrapped up as a Christmas present. The tagline: “Harvey Nichols. Not Just for Christmas.” The video is a humorous send-up of the fashionistas who don’t just accessorize their dogs, but use the dogs to accessorize themselves. The Harvey Nichols Christmas campaign was developed at DDB, London, by creative team Sam Turk and Paul Robbins, creative directors Jeremy Craigen, Grant Parker and Simon Richings, account team Paul Billingsley and Charlotte Evans, agency planner Kathy Slack, agency producer Maggie Blundell and Vicky Cullen, project manager Caroline Tripp, and agency producer Vicky Cullen. Filming was shot in the Harvey Nichols Knightsbridge store by director Damien O’Donnell via Another Film Company with producer Adam Saward. 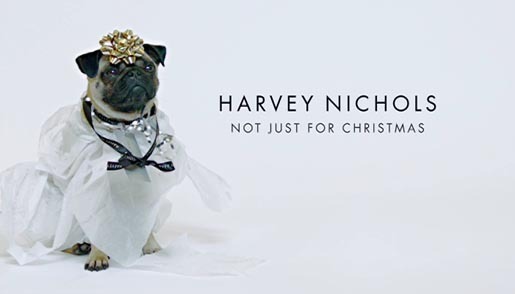 Harvey Nichols does not sell animals of any sort in their stores and they do not condone the buying or giving of a dog as a gift in the manner of a bag or accessory. During the production of this film there was a vet present and on hand to approve all scenes. A professional handler sourced the dogs and was also present to ensure all the dogs were happy, safe and not put in any distress.Although Dogs Trust was not involved with this video Harvey Nichols fully support the charity’s famous slogan: A Dog is for Life, not just for Christmas. To see their Christmas message please go to: www.adogisforlife.com.